Wanda tires are produced by one of the largest manufacturers in Asia. Our product line is ISO 9002 certified and approved by the Department of Transportation (DOT) in the United States. Product volume has increased dramatically in recent years, starting in 1996 when Wanda bicycle tire production accounted for 25% of the entire domestic market. The Wanda lines include tires for motorcycles, bicycles, light trucks, agricultural and industrial vehicles, as well as tires for high-speed trailers and wheelbarrows. Each product line has a comprehensive selection of service applications and tread types. 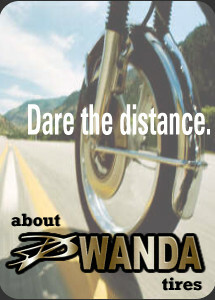 If you're looking for motorcycle tires, take a look through the featured motorcycle section here at 21st-Century-Tires.com that highlights Wanda's 48 tread patterns for standard street and scooter use. We have a tire to tackle any terrain or road surface ... and we dare the distance! Through our tremendous marketing efforts and the expertise of 21st Century Tires, our tires are now sold throughout Southeast Asia, the Middle East, Africa, Central and South America, and the United States.